To complement my daily blog interviews I like to bring something a little different from time to time and today is the first of a new author spotlight series; historian, novelist, poet, non-fiction and short story writer (and more) Dr Michael Hogan. You can read the others here. If you like what you read, please do go and investigate the authors further. Based in Guadalajara, Mexico, Michael is the author of eighteen books, including a collection of short stories, six books of poetry, selected essays on teaching in Latin America, two novels, and the best-selling Irish Soldiers of Mexico, a history of the Irish battalion in Mexico which formed the basis for an MGM movie starring Tom Berenger. His latest non-fiction work, Savage Capitalism and the Myth of Democracy: Latin America in the Third Millennium, has been praised by Noam Chomsky who wrote: “These lucid and thoughtful essays provide a valuable picture of Latin America from a point of view that is perceptive, often controversial, but always instructive.” His newest novel, A Death in Newport, has delighted readers of international intrigue and police fiction. My latest publications are a fascinating history, a novel about the Irish in Mexico, and an international thriller A Death in Newport. The history is ‘The Irish Soldiers of Mexico’ just released on Kindle. In this book I recount the little-known story of the Irish battalion which fought in the Mexican War. This is the least-studied and least-documented war in American history, although the U.S. invasion and subsequent conquest of Mexico deprived Mexico of half of its territory, enriched the U.S. by two-fifths of its current land mass, and relegated Mexico to Third World nation status. Manifest Destiny and a pervasive Anglo-based American ethnocentricism were the powerful impulses prodding mid-19th century American politics, resulting in the nation’s imperialistic designs on Mexico and precipitating the Mexican American War. Critics of the war included, among others, two future presidents, Lincoln and Grant, and author Henry David Thoreau who wrote his famous “Civil Disobedience” in reaction to the U.S. invasion of its southern neighbor. Within the U.S. there were over 9,000 deserters; a larger number than all our other wars combined. Among the latter were Irish-Americans, many of whom, for diverse reasons (including discrimination against the Irish and anti-Catholicism) joined the Mexican military, forming the St. Patrick’s Battalion. In this study I explore the motivation of these Irishmen, their valiant contributions to the Mexican cause, and the consequences when they were captured, including military courts-martial and hangings. An MGM film, “One Man’s Hero” starring Tom Berenger, was based loosely on this history, in addition to two award-winning documentaries which were shelved by U.S. distributors but viewed widely by international audiences. Last year, Ry Cooder and the Chieftains released an album called “The San Patricios” commemorating the Irish battalion which demonstrates the on-going attraction of this period of history and these Irish renegades. The second book on this subject won the Ojo del Lago Award for fiction in Guadalajara, Mexico. 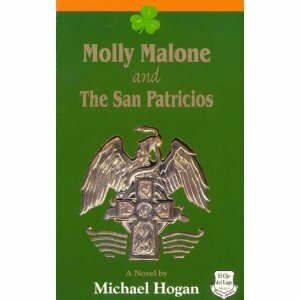 Molly Malone and the San Patricios has just been released this month in a Kindle Edition in English. Hungry, homeless and in trouble with the law after eluding slow death in the Irish Famine, Kevin Dillon enlists in the American Army. When he discovers that the “Army of Observation” in Texas is poised for the invasion of a peaceful Catholic country, Kevin and his friends slip across the Rio Bravo at night. There they join John Riley of the St. Patrick’s (San Patricio) Battalion and fight on the Mexican side. The last of the recruits, a golden-eyed Doberman dubbed Molly Malone, proves to be a warrior of unquestioned loyalty and courage. She follows Kevin and the Irishmen through the deadliest of battles, even to the gallows where 85 of them are hanged. Praised by critics for its characterization and by the Mexican military for the accuracy of battle descriptions, this recreation brings the history of the era alive with all its violence and nobility, contradictions and ideals. An earlier book on the topic, The Shamrock and the Sword (1989) by Robert Ryal Miller is often compared with my book. The Shamrock and the Sword drew largely on U.S. military sources and gave the perspective from the American side. The Irish Soldiers of Mexico was written to some extent in reaction to it, with Professor. Miller’s blessing. I am a permanent resident of Mexico and bilingual so I had opportunities that Miller did not have. I was able to search the Mexican military archives at my leisure, to visit all the battlefields, to translate personal papers and documents of contemporaries of the period, and to interview descendents of the Irish soldiers. I drew largely on Mexican sources and contemporary accounts of anti-Catholicism, racial discrimination against the Irish, and solidarity of Irish and Mexicans. Both books, however, are thoroughly documented with hundred of notes and extensive bibliographies as well as with maps and photographs. Miller tells the story from the perspective of the winners (as most histories do), while I give the perspective of those who fought gallantly and lost. 5. A video showing the Museo de Intervenciones which is the museum depicting the history of the many invasions of Mexico by foreign powers, primarily France and the United States. It is also the former Convento de Churubusco where the fiercest battle between the Saint Patrick’s Battalion (San Patricios) and U.S. forces took place. (http://www.youtube.com/watch?v=ChICvBHtgF4). The blog interviews will return as normal tomorrow with mystery / thriller author Robert O’Hanneson – the ninety-second of my blog interviews with novelists, poets, directors, bloggers, autobiographers and more. If you like what you read, please do go and investigate the author further. A list of interviewees (blogged and scheduled) can be found at https://morgenbailey.wordpress.com/blog-interviews. And I enjoy hearing from readers of my blog; do leave a comment on the relevant interview (the interviewees love to hear from you too!) and / or email me at morgen@morgenbailey.com. You can also read / download my eBooks here. Dr Michael Hogan is the most important Historians on the Mexican American War alive today. The War that created a world superpower..His book the Irish Soldiers of Mexico should be read by all that search for a path of understanding in our world. The story of the San Patricios is among the most gripping and the most poignant in the history of Mexico, the U.S., and Ireland. Thanks so much for providing a spotlight on it, and on author Michael Hogan. Thanks for your comments, Folks. They are appreciated. A complete list of all the San Patricios is also in the book for those who, like Shaun, might have an an ancestor who fought in Mexico. Saludos a todos desde Guadalajara. And thank you so much, Morgen, for having me as a guest this week on your wonderul blog. Michael Hogan does a great job of showing us this fascinating part of history. Truly enjoyed learning about the political climate of the time and America’s perspective of immigration. Fascinated by my Irish-Mexican heritage, I began reading about the Mexican-American war. I learned that most accounts were biased toward the U.S. thus justifying manifest destiny. In my search for more accurate accounts, I came across Dr. Hogan’s book. The fortunate, for me, result was making contact with the professor. As a retired person, I have time to spend with my hobby: writing police procedurals. Under my birth name (Jess Waid Escobar), I intend to write about the aforementioned period in an unbiased way that will draw in a Mexican (albeit Spaniard heritage) and an Irishman who become close friends and share experiences that hopefully will draw in the reader with a truer understanding of the time. My dream is to collaborate with Dr. Michael Hogan in such a historical novel. We will be dining together in Guadalajara in November to discuss it. He is aware of this missive, which I had intended to put on your blog, but have since not been able to pull it up. Hence, I am sending it to you to let you know I like what your are doing. I hope to listen/watch the upcoming interview on August 21. What a fascinating and relevant addition of Mexican-American History, especially given the losses and gains. Just fascinating! Should be added to school curriculum.